Ferdinand de Saussure's Cours de linguistique generale was posthumously composed by his students from the notes they had made at his lectures. The book became one of the most influential works of the twentieth century, giving direction to modern linguistics and inspiration to literary and cultural theory. Before he died Saussure told friends he was writing up the lectures himself but no evidence of this was found. Eighty years later in 1996 amanuscript in Saussure's hand was discovered in the orangerie of his family house in Geneva. This proved to be the missing original of the great work. 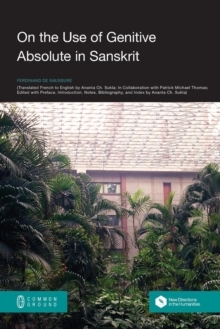 It is published now in English for the first time in an edition edited by Simon Bouquet and Rudolf Engler, and translated and introduced by Carol Sanders and Matthew Pires,all leading Saussure scholars. 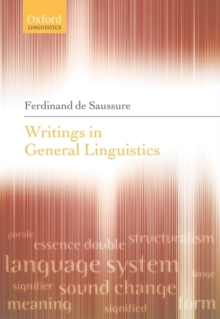 The book includes an earlier discovered manuscript on the philosophy of language, Saussure's own notes for lectures, and a comprehensive bibliography of major work on Saussure from 1970 to 2004. 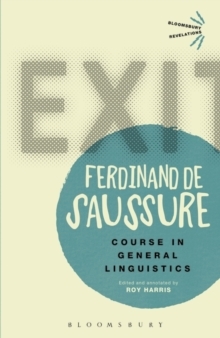 It is remarkable that for eighty years the understanding of Saussure's thought has depended on an incomplete and non-definitive text, the sometimes aphoristic formulations of which gave rise to many creative interpretations and arguments for and against Saussure. Did he, or did he not, see language as a-social and a-historical? Did he, or did he not, rule out the study of speech within linguistics? Was he a reductionist? These disputes and many others can now be resolved on basis of the worknow published. 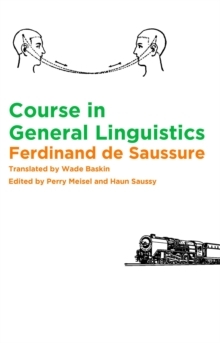 This reveals new depth and subtetly in Saussure's thoughts on the nature and complex workings of language, particularly his famous binary oppositions between form and meaning, the sign and what is signified, and language (langue) and its performance (parole).